See more of Brian Denham's photos, or visit his profile. I just found this picture today. 11 years after it was taken. 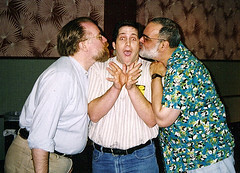 I cropped it close, but this picture shows that it was taken on March 15, 1998 at the Florida Mega-Con. I was debuting my comic, American Woman, at the show. John Byrne sat across from us and he had a huge line the whole weekend. I talked to George Perez at the end of the show one day, we talked before at a couple of shows in Dallas and I felt comfortable around him. I asked if I could get a picture with him and John Byrne who was leaving and walking right toward us. George said "Sure!" and yelled for John to come over. LOL I was so excited. George explained that I wanted a picture and John said a joke about kissing me on both sides. They laughed, leaned in and planted the smooches on me. Funniest moment in my life ever. I laughed a bit to myself thinking of the time I met Jack Kirby. I told the King that I didn't want an autograph, but I did want to shake his hand. As we were shaking hands I told him maybe his magic will rub off on me. He looked at me like I was a nut, of course I was a teenager at the time so I probably was a nut.